After a month of indulging on Asian meals, a small part of me was craving for slabs of meat. Just as well the girl who got me the job here suggested Fyr Cycene ond Drinc for lunch. Miss P sold me Singapore over the phone and has been spot on with her recommendations - she knows her stuff. We both went for the same starters. As you could see the foie gras was a tad wrinkly as it wasn’t seared to a crispy edge to give it the charred fragile shell. Nonetheless the centre was still of a wobbly softness; it was buttery rich and exuded powerful greasy fragrance. Gula melaka translates to palm sugar, which was the intended substitute for the usual port reduction. The sweetness was either very subtle or the sharp berry compote had pierced through it. That said the acidity helped to lift the oils and worked well. The slice of brioche could be a couple of centimetres bigger to even out the ratio with the weighty slab of foie gras, but this is minor. The kitchen uses a josper grill, which makes it perfect for thick cuts of meat to sealed the juices in at high temperature. I asked for medium rare but this came as a medium. I didn't send it back - medium was still okay. The steak was a decent piece of meat, inch-thick with a generous rind of fat, unfortunately I have been crazily spoilt when it comes to steak. Having enjoyed dry-aged beef for the past few years, this striploin wasn’t beefy and intense enough; though juicy, the flavour felt diluted and slightly bland. Moreover I’m a rib-eye girl, so the leaner loin isn’t my preferred cut as it has a coarser texture. Sadly it didn’t quite hit the steak-craving spot for me. Originally we both opted for the same mains, but like real foodies ordering identical courses is frowned upon, so we agreed to diverse and share. And I’m so glad we did because this was sublime. Pork collar is sometimes referred to as butchers’ secret; the sturdy muscle is laced with fat that creates a marbling effect, which keeps the meat incredibly succulent upon grilling. Thai cuisine often barbecues this neck muscle with lemongrass and serve as a starter. Here the collar was beautifully charred to give it a smoky aroma, then eat chew was squirting more nutty piggy oils as the soft meat dissolved away. It was heavenly. Yes it’s greasy and heavy, but damn it’s worth the 8-mile run that follows. This could be the best dessert I have had in recent years. Regulars may have noticed I rarely write much about dessert because you could more or less deduce what to expect by reading the description on the menu, unless it’s epically awful then I take pleasure in ripping it apart - it’s cheaper than anger management. The ‘melt’ is like a fondant; hot fragrant pandan custard oozes from the moist, spongy pistachio shell, playfully contrasted by the ice cream. The toasted marshmellow with a gooey centre added extra textures to the ensemble. Apparently some people think it’s too sweet, we thought it was just right. 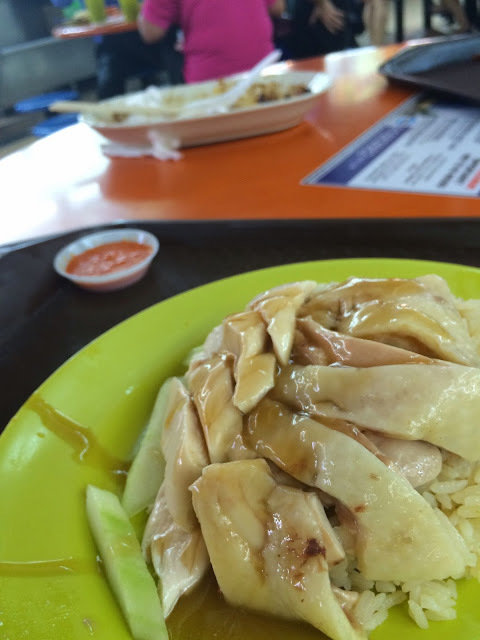 It would have been an ultra heavy weekday lunch, but given it was Friday… we were allowed. I really enjoyed Fyr Cycene ond Drinc. Though there was nothing signatory about the menu, the kitchen did justice to the meat, especially that hunk of pork collar. Even the striploin, it was definitely more my spoilt palate than their under-delivery. With the vibrant vibe, friendly staff and super satisfying menu, I can see myself coming back. Michal’s condo is 2 mins walk from where I am staying at the moment, yet it has taken us a month to meet up. Wow I’ve been here for a month already. Wow we’re busy people. Wow I’ve met a lot of people over the last few weeks. A good girly catch up over Sunday brunch is finally in order. 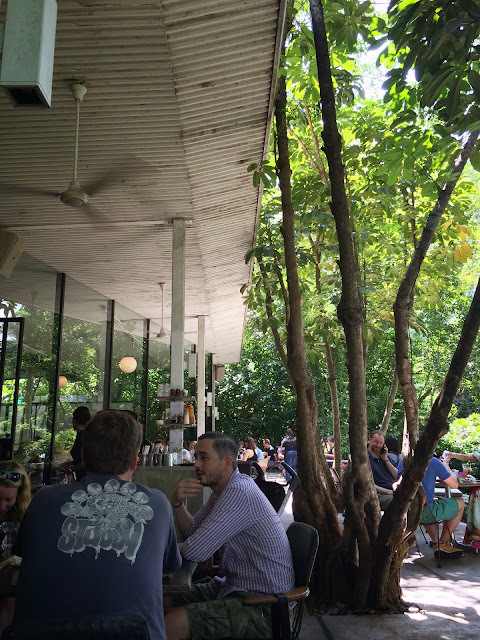 Since Dempsey Hill is only 5mins taxi away, we thought we’d check out PS cafe. Nested among trees and gardens with the greenhouse-façade, the vibe at PS Café oozes an unmistakably hip vibe. And there is inevitably a queue, luckily it was only a brief 20-min wait before we were seated on the patio. It wasn’t too hot to sit outside as we were in the shade with fans here and there. However I forgot I’m a mosquito-magnet… my blood must be sweet. Despite the brunch burger craze in London, where there seemed to be a competition around who could serve up the tallest burger tower that challenged the flexibility of our jaws, this is my very first brunch burger. I was very tempted by Foxlow, but their menu had other much more exciting options than cramming a full breakfast between buns. Seeing PS Café is offering a wagyu patty here, I thought it’s worth trying. The patty was nicely done to a medium as requested; normally I’d ask for medium rare but if there is a high proportion of wagyu in the mix medium usually works better. Turns out there isn’t in this one. As I previously mentioned, the term “wagyu” is used very loosely nowadays, even beef with only 1% wagyu breed in the bloodline can still be branded with the name; I suspect such in this case. I may be wrong on this, but I believe the legendary Yianni Papoutsis from MeatLiquor led the “steaming” of the patties on the grill to preserve their succulence (I may not be a MEAT franchise fan but they deserve credit for revolutionizing the burger scene in London). PS Cafe still needs to pick up the art here as the meat was leaning on the grainy and dry side, it wasn’t sinfully parched that the cow died a meaningless death, but I have had juicier and more flavoursome burgers. That aside I wasn’t mad about the spinach either as the whole lump came off in first bite and ruined the mouthfeel. On the plus side the patty was thick and hunky, the bacon was just done with a crispy edge, the overall bun:filling ratio was good and the chunky chips hits the spot with the slightly sweet aioli. I loved the ambience and décor at PS Café; food was average though I have yet to establish the benchmark for western food in Singapore. Regardless it was a great spot for a long overdue catch up; I can see myself coming back for lazy Sundays, sitting indoors, of course.